If you are looking for a fun and unusual pet to raise and nurture, consider getting a hedgehog. 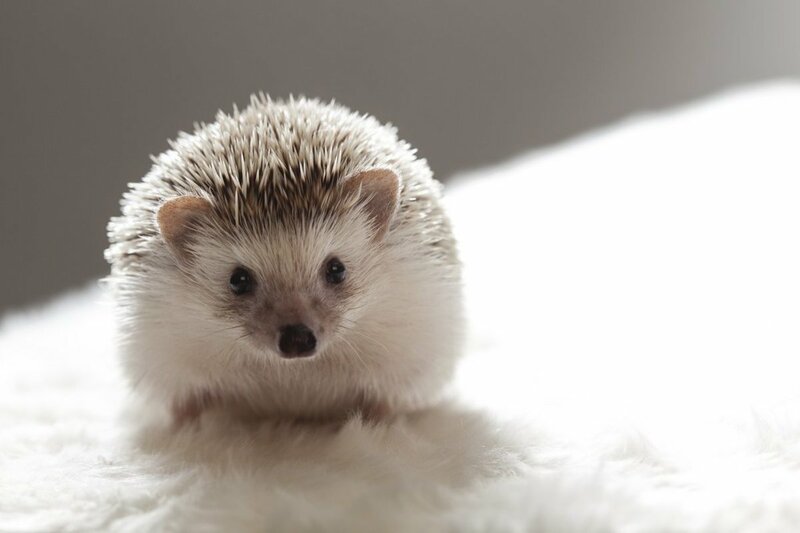 Although a lot of people wouldn't even consider hedgehogs as a viable option for a pet, just like hamsters, ferrets, and other small mammals, raising these cute little animals can be both fun and a rewarding experience. Although relatively easy to raise and take care of, like most animals pet hedgehogs need to be cared for properly in order to remain healthy and happy. There are several considerations to keep in mind when deciding if this is the right choice of pet for you. Read on as we explore the pros and cons of having a pet hedgehog. 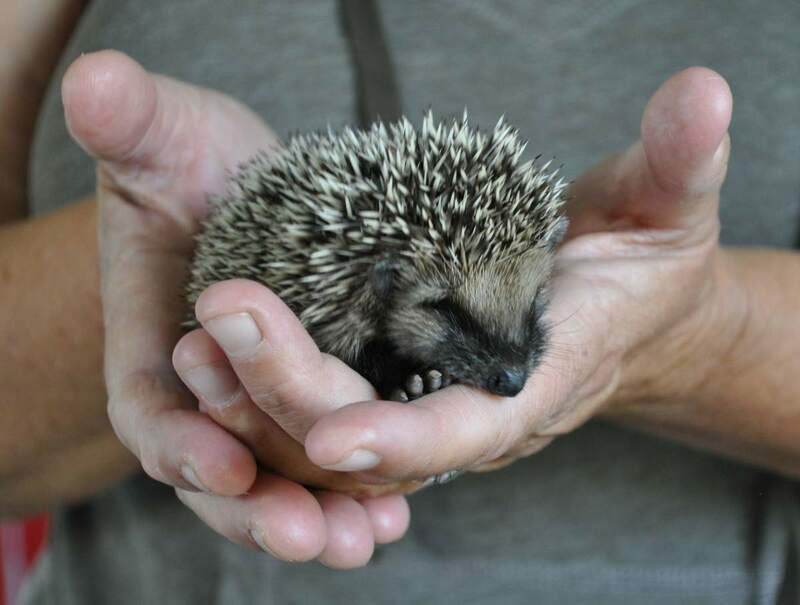 The African Pygmy variety is the favorite of most hedgehog owners. The prevalent species of hedgehogs raised as pets are African pygmy hedgehogs. They are actually hybrids of the white-bellied or four-toes hedgehog (Atelerix albiventris) and the Algerian (A. algirus) hedgehog. It is called African pygmy due to the fact that it is smaller than another popular pet hedgehog species known as the European hedgehog (Erinaceus europaeus). Along with the African pygmy and European species, other popular breeds for raising are the Indian long-eared hedgehog (Hemiechinus collaris) and the Egyptian long-eared hedgehog (Hemiechinus auritus auritus). 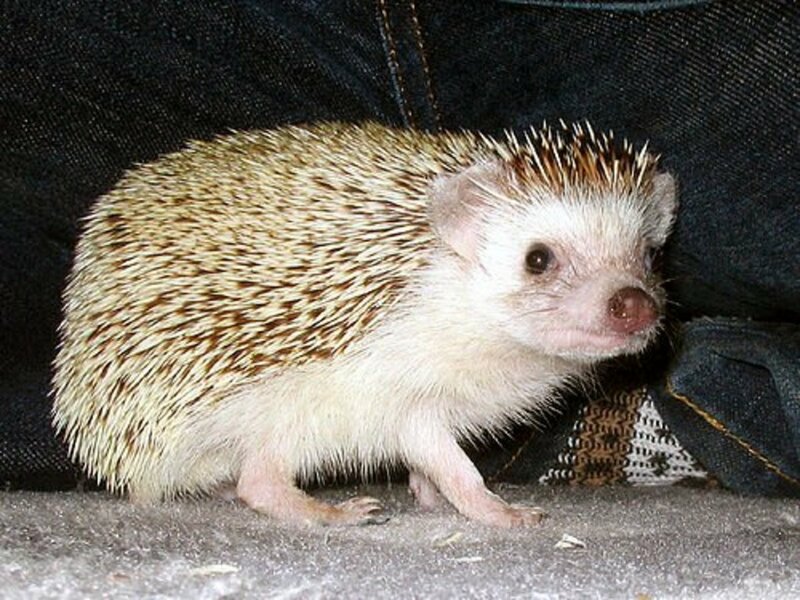 The rise in popularity of pet hedgehogs has also led to the breeding of new hybrids such as the pinto and albino varieties. Healthy hedgehogs can live up to 10 years. The gestation period for hedgehogs ranges from 35 to 58 days, depending on the species. The larger species will have litters of 3 to 4 baby hedgehogs, while the smaller species will have 5 to 6 little ones. As with most small mammals kept as pets, hedgehogs live longer in captivity, mainly due to a better diet and a lack of natural predators. Larger species live 4 to 7 years in the wild, and 8 to 10 years in captivity. Smaller species live 2 to 4 years in the wild and 4 to 7 years in captivity. 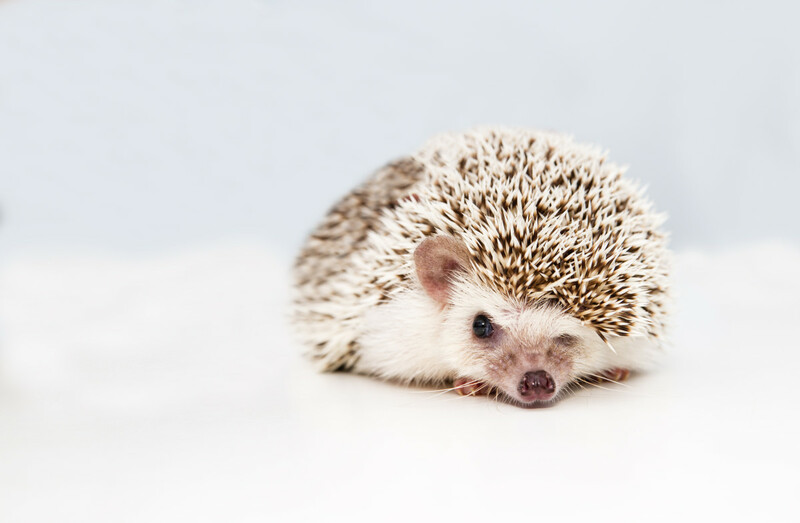 As with a lot of small mammals, hedgehogs are blind at birth. Hedgehogs have several means of defense. All species of hedgehogs share a common means of defense which is similar to that used by porcupines. The average hedgehog has between 5,000 and 7,000 quills on the body. The hedgehog also has 2 large muscles in its back which it uses to position the quills in a manner that covers the entire body. They roll up in a ball and pull in their head and feet, making it is almost impossible to get past their defenses. This maneuver is usually used as a last means of defense, and species like the desert hedgehog will actually go on the offensive and try to attack a predator or enemy by ramming it with its quills. Hedgehogs also have a certain amount of immunity to snake venom, although a hedgehog will more than likely die from a rattlesnake bite, as the protein (erinacin) being utilized as a defense is available in very small amounts. People can sometimes be problematic for hedgehogs. 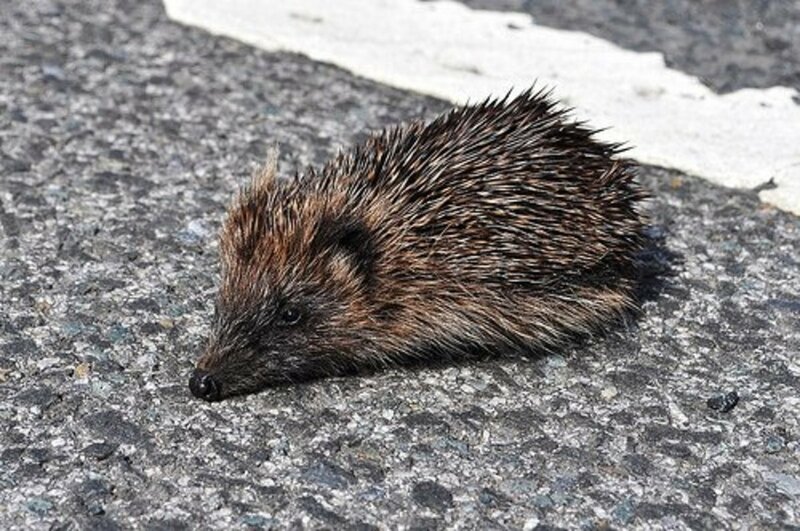 Cars pose the greatest threat to hedgehogs, as a lot of them get run over crossing roads in search of food. Overpopulation is also a problem in areas where they have been introduced that have no natural predators to help keep the numbers down. This usually ends up with unexpected consequences, as once the insects and other foods they normally eat starts to become scarce, they will expand their diet and start searching out snails, worms, and bird & lizard eggs, which in turn can disrupt the food chain balance. Some US states and Canadien municipalities ban the ownership of hedgehogs. Species meant for domestication are allowed in most European countries. Wild hedgehogs are listed as endangered in the UK, and keeping them as pets is not legal. Hedgehogs are enjoyed as a source of food in several cultures. The Ancient Egyptians ate hedgehogs, and there are some recipes found from later in the Middle Ages that call for hedgehog meat. "Hedgehog-flavour" crisps were introduced to the British population in the 1980s, although the snacks didn't actually contain hedgehogs in any way. The Bedouins in the Middle East consider hedgehog meat medicinal and good for treating arthritis. The Romani are reported to still eat hedgehog meat boiled or roasted, and keep the fat and blood for its medicinal properties. If there is one thing that is important to keep in mind about hedgehogs is the fact that they are nocturnal by nature. Hedgehogs like to sleep during the day and forage for food and mates after nightfall. Solitary as a rule, hedgehogs have a tendency to be territorial in the wild and will display aggressiveness towards other hedgehogs it feels are a threat to them. Self-anointing is a mysterious and misunderstood hedgehog ritual. When hedgehogs run across a scent they have not encountered before, they sometimes perform a ritual that is called "self-anointing." Also called "anting", it is performed by licking and biting at the source of the scent, then forming a froth, which it pastes along the body using the tongue. There are several theories as to why hedgehogs do this, ranging from cooling the body to making a poison as a protection against enemies. Others say it is a form of cleansing, as in a lot of cases it happens after a hedgehog has encountered a rather strong odor. A cute but potentially dangerous hedgehog trick. 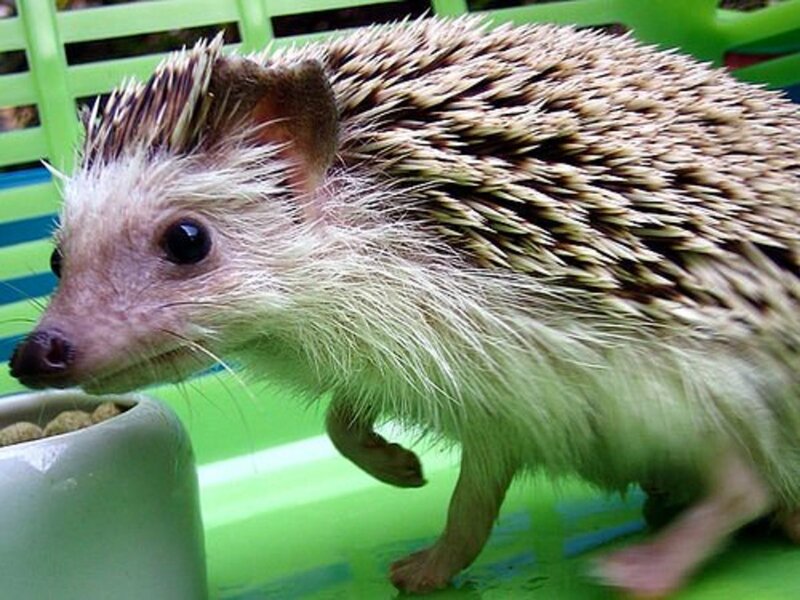 Pet hedgehogs have a curious habit of sticking their heads in tubular shaped containers and walking around with the tubes stuck on top of their heads. This is known as "tubing" in hedgehog circles. Although a cute trick, a good hedgehog owner will provide clean tubes (usually empty toilet paper rolls) and not just walk off and leave them alone, as they will stay like that for hours on end. Interestingly, McDonald's had to change the design of their "McFlurry" containers, as hedgehogs would get their heads stuck in them trying to lick the food out, and if not released, they would starve to death. A Video Demonstration of Hedgehog "Tubing"
There are several varieties of hedgehogs that make for good pets but even then, there are a few things to look for when you have decided on a breed. If you are at a pet store choosing a hedgehog, look for the ones with bright eyes and display signs of curiosity. If the hedgehog looks lethargic or tired, chances are it will not make a good pet, and in fact may be ill. Check around the eyes for redness or any discharges. If the eyes don't look clean and dry, move on to the next one. Hedgehogs make great pets, but the wrong one can be more problems than it is worth, and may end up displaying aggressive tendencies towards your family members. Hedgehogs will bite if they are sick or feel threatened in any way. As you can probably tell by now, hedgehogs are unusual and delightful animals. They do need proper care, though, and listed here are some of the basic needs of your pet hedgehog once you get him home. Hedgehogs are active creatures and therefore need some extra space to roam around in. You should have a large cage or enclosure that can be secured when you are away, as hedgehogs like to escape whenever the opportunity presents itself. A small box kept inside the cage will provide them a place to hide in and sleep during the day. Try to keep the room temperature comfortable as well. Hedgehogs eat once or twice a day. Keep the food right outside of the hiding box that was recommended earlier. Hedgehogs like eating insects and worms, but finely minced rice and meat or a low-fat cat or dog food will suffice in case you don't have fresh bugs to feed them. A piece of fresh fruit from time to time is recommended. As with most pets, be wary of overfeeding to the point of obesity. Make sure to clean out the cages at least once a week. Remove old food and feces and make sure the hide box is clean as well. An occasional bath from time to time may be in order, but if your hedgehog does not like baths, you may want to avoid putting them through any unnecessary trauma. 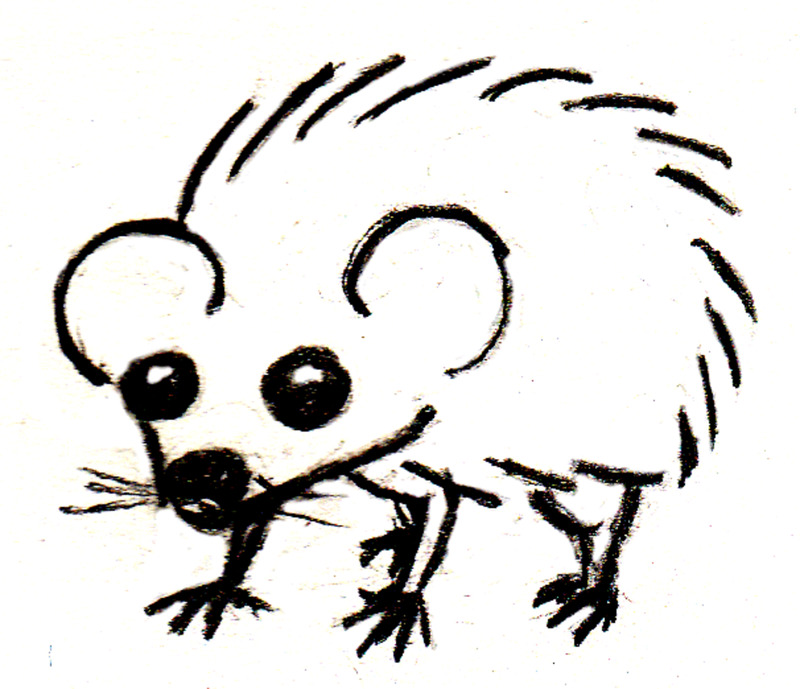 As with most small mammals, hedgehogs can get fleas. Check them on a regular basis, and if you see signs of fleas you can use the same flea deterrent that you would use on a kitten. Hedgehogs are also susceptible to diarrhea, worms, and pneumonia. If you suspect your hedgehog may be sick, take him to a vet. Some of the diseases common to hedgehogs include squamous cell carcinoma (cancer), fatty liver disease from improper diet, and they can suffer from heart disease as well. A good indicator of a sick hedgehog is the loss of spines. As a rule, hedgehogs can be a bit on the anti-social side until you get to know them. 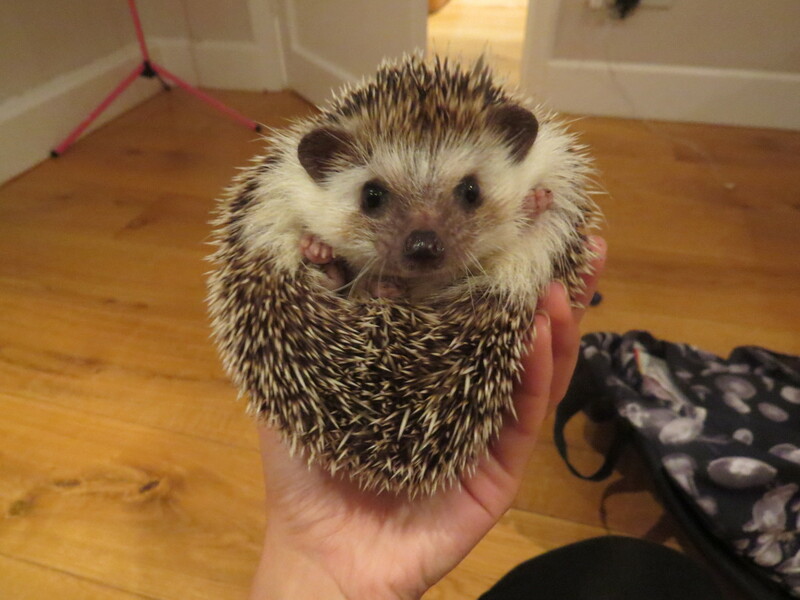 Do not over-handle your hedgehog, as this may lead to mistrust on their part. Hedgehogs do like to be cuddled from time to time, but if they roll up in a defensive posture when you try to pick them up, it is best to leave them alone for a while. Hedgehogs like to be cuddled! Even though you can domesticate a hedgehog, it still may have a desire to escape captivity. Every now and then let your hedgehog out of it's cage to roam around a bit. If you have a garden all the better. Be there with your hedgehog if you let him roam around, and talk to him to let him know he is not alone. Most hedgehogs will let you cuddle them once they trust you. When petting them, be sure to stroke them the same direction that the quills grow, or prepare to be stuck by some very sharp quills. There is a certain amount of bonding that occurs with a hedgehog, same as with any other pet that is comfortable with you. Approach them when they are in a calm mood and get to know them slowly and methodically and you will find them to be great pets. At one time hedgehogs were classified in the now abandoned Insectivora order. The truth is, they are omnivores, meaning they will eat many things, including berries, mushrooms, roots, and melons. Their main diet consists of insects and worms, but they have been known to consume frogs, toads, snake and bird eggs, and carrion and fungi as well. There are several choices these days when it comes to foods formulated specifically for hedgehogs, but if you find that you cannot find a suitable hedgehog food, a low fat, high protein cat food will do in a pinch. Treat your hedgehog to live worms or crickets from time to time, and add a piece of fresh fruit to their diet to keep them happy. Still Deciding on a Pet Hedgehog? If you are on the fence about raising a pet hedgehog, let's look at both sides of the issue. Some of the benefits of caring for hedgehogs is they are small and pretty easy to take care of. Unlike some animals, they have no dander to bother those with allergies. Hedgehogs are a ton of fun to play with, and once they are comfortable in their environment, they are quite friendly. Some of the drawbacks to owning a pet hedgehog include the fact that they don't live very long, on average three to five years. Also, if threatened or agitated they will bite, and their bites can be quite painful. In conclusion, if you are looking for a cute and playful pet that is low maintenance and inexpensive to care for, a hedgehog may be just what you are searching for! What Do You Think of Hedgehogs? They are adorable and I want one! Their beady little eyes and scary looking quills terrify me! I have no opinion, but I do like to take polls! Would You Consider a Hedgehog as a Pet? Did You Find This Article Helpful or Entertaining in Any Way? I hope this isn't the last poll! Can two female or two male hedgehogs share a cage? Once male hedgehogs reach sexual maturity, it is best to keep them in separate cages. Males can be quite aggressive towards one another during mating season, and the fights can be rather vicious, with one or more of the hedgehogs causing serious injury and damage. While hedgehogs are generally solitary animals, you can cage females together without too much fighting between them. Visitor Comments - Did I Miss Anything? If you have a fairly new hedgehog it may take a while for it to get used to you and it's new surroundings. I would back off handling it for a bit, and try and take a slower approach. Good luck! My hedgehog curls up so tight when I pick it up. How do I get it to relax? 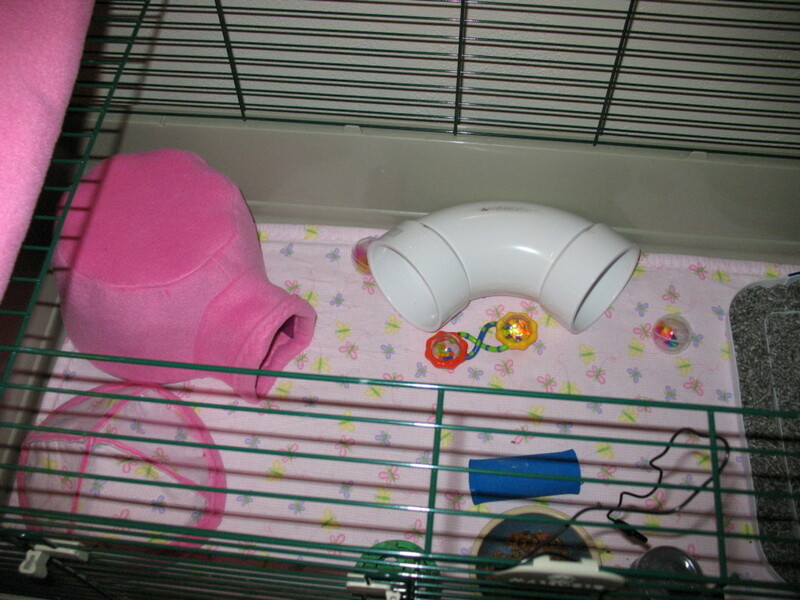 I keep the cage spotless and feed twice a day and give plenty of water. I LOVE hedgies. I am trying to convince my family to let me get one. I love hedgehogs! I’m getting one tomorrow! 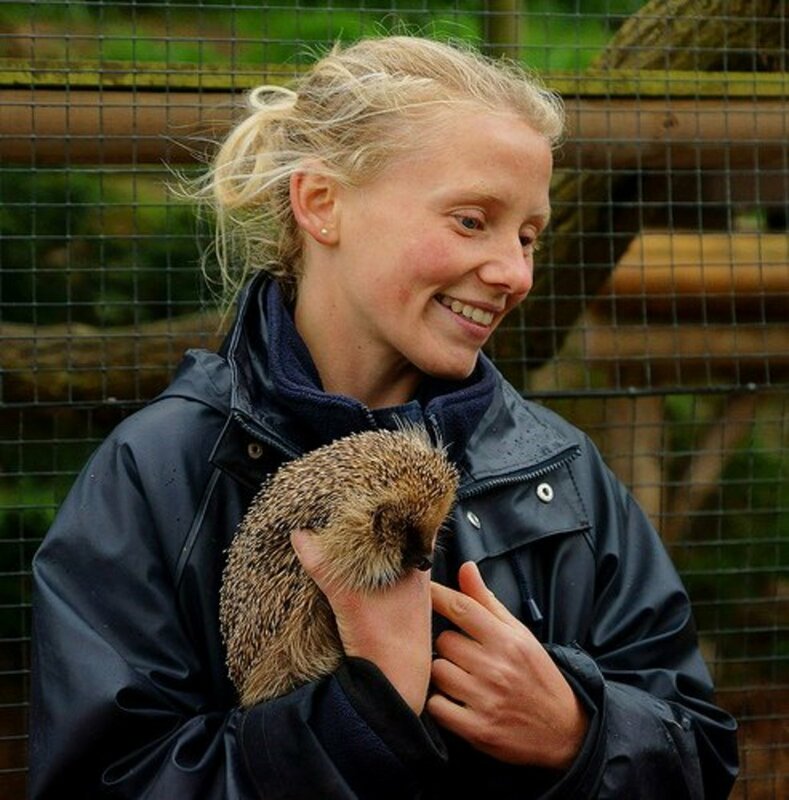 I love hedgehogs, I used to look after wild ones that had been injured, they were very cute, but they didn't half smell bad! @LoriBeninger: How could you go wrong picking hedgehog. They do kinda grow on you! Very cute lens. One evening after dinner, my friends and I were discussing what our "Patronus" (from Harry Potter) might be if such a thing were possible. All had been decided upon when my husband's turn came. He (and some of the others) were suggesting tiger and stallion and wonderfully masculine things (my husband is a former police officer) when I yelled out "Hedgehog." When asked why, I said that he was prickly on the outside and soft on the inside. It stuck (much to his chagrin) and he gets a hedgehog-related gift each year from his godchildren to celebrate. I think he rather likes it after all. I like your last options in the polls. 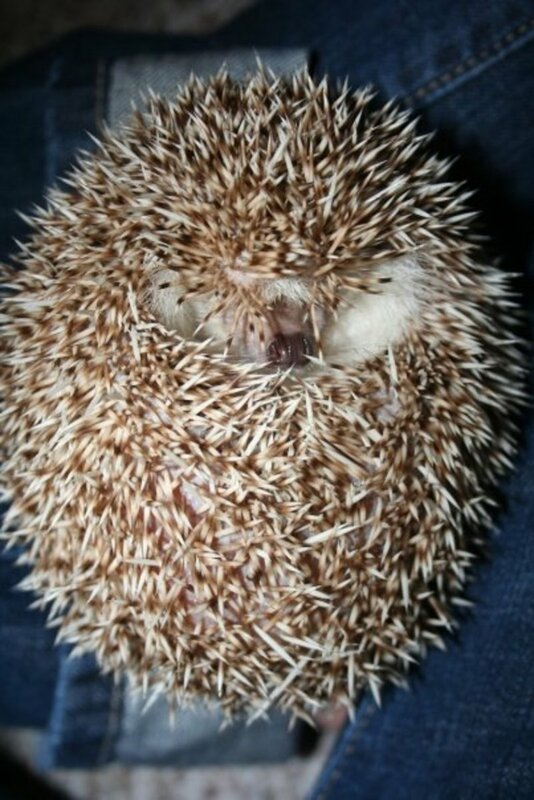 If I did have a pet hedgehog, it would be difficult to name it anything other than Sonic. These animals look remarkably like the Australian Echnida only it is a marsupial (has a pouch). Great lens and nicely done information. I've never owned a hedgehog so I don't know if you missed anything, but it does seem like a very complete lens to me. Sweet animals! @Stephanie36: Hedgehogs are so "cute and cuddly". Glad you enjoyed the visit! Now I want a hedgehog! (won't happen...my cat would be far too entertained!) I love all the pictures, espeically the one with the baby hedgehogs--so cute! Fantastic job on this lens--really superb. I'm rather fond of hedgehogs as we had a wild one living in our garden shed for 2 or 3 years. We called her Barbie as I found her wrapped in clingfilm one day, and also saw her trying to wrangle a plastic bag into her nest. She lived in a bag of hay, til the shed started to leak, then she moved into the greenhouse. She brought up at least two litters. Thanks for the information about Hedgehog. i really enjoyed your lens. thanks for sharing. Thanks for the lovely pictures. 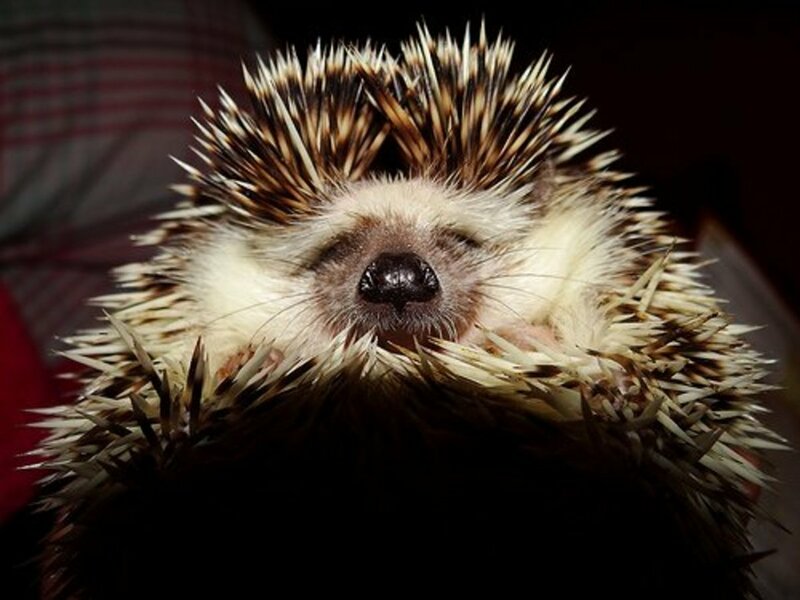 I was pleased to find the definitive hedgehog lens! When we were children growing up in France, we raised 3 orphaned hedgehogs, It was a wonderful experience. I have wild hedgehogs in my garden and they've become quite tame. They'll even crawl under the fence to my enclosed patio and eat the cat's food right out of the bowl. And they make such cute snuffling noises when you leave them something they especially like to eat. Hedgehogs are really cute! We've kept guinea pigs and hamster, gerbils and rabbits, but so far -- we haven't taken in any hedgehogs. Maybe some day... Great lens! 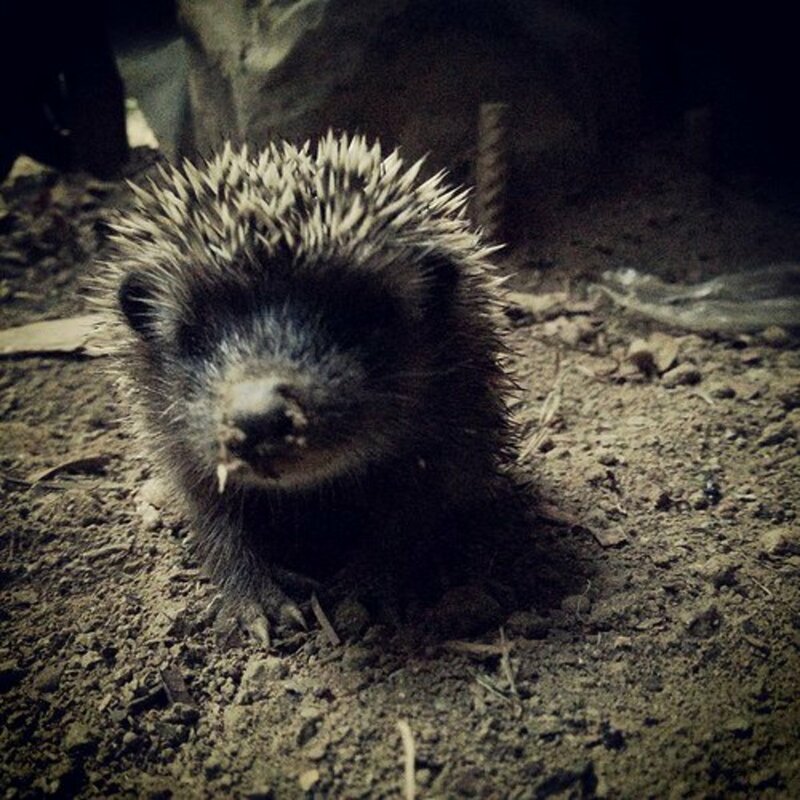 My husband found a hibernating hedgehog and we put it in our barn. Sadly, it seems to have wandered off! Wish we had hedgehogs in the garden. Hedgehogs are cute, but I prefer a cuddly chinchilla. Adorable pics and poster here! Cute little guys. Enjoyed the quiz and my visit here. Great lens, I like hedgehogs, and I have never been bitten by one yet, it was the only one I got wrong in your quiz, I must have handled them okay not to get a bite. Blessed. I didn't even know that you could have a pet hedgehog!!!! Blessed! A terrific article that I am going to Stumble. I have heard about hedgehogs for years but had no idea about their nature, and certainly no idea that they would make pets. I sincerely hope people will find this fine, well written piece on these cute critters. You have done a lovely job here of capturing the essence of the hedgehog, and lots of the details as well. Pinned to my "cool critters" board and blessed. Thank You for writing about them! Great lens!